Technology Dwell: How to clone or Image hard drives? How to migrate Windows installation and all installed applications to a new drive? Upgrading HDD to SDD? How to clone or Image hard drives? How to migrate Windows installation and all installed applications to a new drive? Upgrading HDD to SDD? You may be looking for Drive cloning or Imaging for creating a bootable backup of your computer’s disk drive or one or more partitions or migrating from HDD to SDD. 1. Download and install DriveImage XML (http://www.runtime.org/dixml.htm). It is free for Home use. 2. 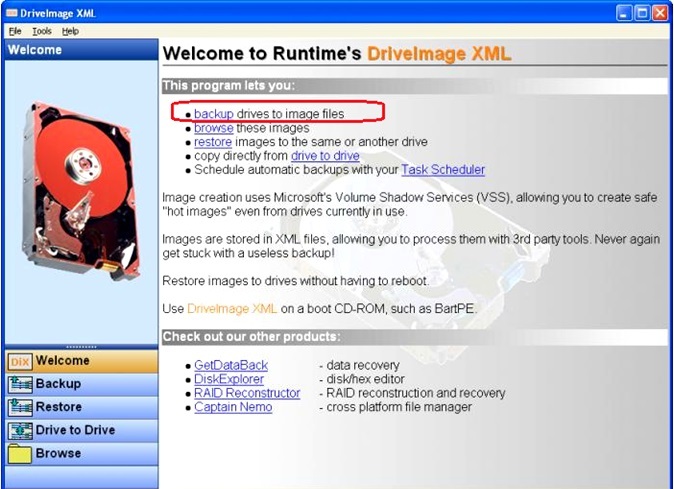 DriveImage XML also supports “Raw” mode, which is basically bit-by-bit cloning/imaging, useful when you intend to conduct some Data Recovery or Forensics too. 4. If your target partition size is lesser than the source partition, OR you want to recreate/resize partitions at target drive, you can use EaseUS Partition Master (http://www.easeus.com/partition-manager/ ) . It is a free disk management tool (For Home use). 5. You may also try to migrate the newly cloned/imaged drive to another computer of similar manufacturer or hardware configuration. If you get any operating system error, you can use a bootable OS CD/DVD or create a bootable USB and try to repair the OS of the cloned/Imaged Disks. To create a bootable Windows USB Flash Drive from ISO file of Windows, you can use Rufus (https://rufus.akeo.ie/ ). Rufus also supports UEFI and GPT. a) With Rufus, select FAT32 file systems, if your windows ISO file size is below 4 GB , otherwise select NTFS . 6. After repairing cloned/imaged drive on new computer, if you get Windows Login screen, but nothing happens after login. i.e. Task Manager works, you are able to run new Tasks such as calculator, cmd.exe but explorer.exe does not work. Possible Reason: At startup Windows looks into the registry and expects installation partition that is C: (usually) for loading OS completely, however the new cloned partition gets drive letter of the portable drive (may be H:, or I:, or J:, …, depending upon your computer). b). Click MountedDevices, and go to Security > Permissions. Verify that Administrators have full control. Close regedt32.exe, and then run regedit.exe. b). Find "\DosDevices\C:". Right-click \DosDevices\C:, and then select Rename to rename this to an unused drive letter "\DosDevices\Y:". c). Find the drive letter of your cloned partition. For example "\DosDevices\I:". Right-click \DosDevices\I:, and rename it to "\DosDevices\C:". d). Select \DosDevices\Y:, and then name it back to "\DosDevices\I:". Close regedit.exe, and then run regedit32.exe. Change the permissions back to the previous setting for Administrators. Restart the computer. Your computer should work normally. 7. In place of SATA interface, if you wish to boot the cloned drive over USB port (portable USB Hard Drive), you may use a good freeware application WinToUSB (http://www.easyuefi.com/wintousb/index.html ). WinToUSB can install/clone Windows to a USB drive with BIOS and UEFI supports. Note: If you want to install Windows onto second HDD/SSD drive without using a CD/DVD/USB drive, or clone your current Windows OS installation to a HDD/SSD drive, you can also try WinToHDD (http://www.easyuefi.com/wintohdd/index.html ). Technology Dwell. Simple theme. Powered by Blogger.